Red faced and angry, he stormed out of the house and drove away. I was crushed. Why take off in the middle of a disagreement and not stay and work things out? Seems I have married a runner. Disheartened, I put our baby into the stroller and we went for a walk around the neighborhood. It felt good to be out in the wonderful fresh air and sunshine. It helped me see things in a much clearer perspective and my anger and frustration disintegrated and turned into understanding. After about an hour of enjoying our lovely brisk walk, the baby and I went back home to find Kevin there waiting for us. 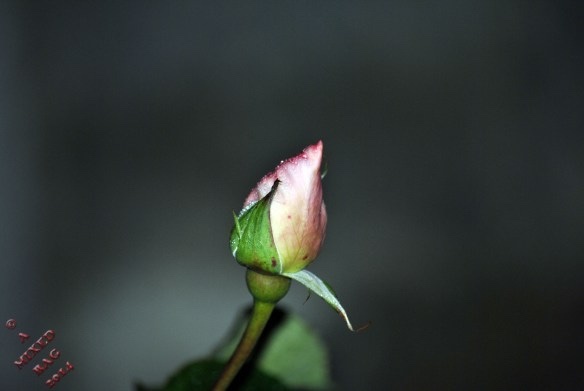 He handed me a single long stemmed beautiful rose bud (his peace offering). Wiping a tear away, I put the bud in a vase and kissed him. I sure love this guy! Making up is simply the best! 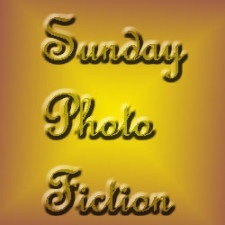 Thank you to Al Forbes for hosting Sunday Photo Fiction challenge and for supplying us with our prompt photo this week. Al provides us with a prompt photo and approximately 100-200 words with which we build our stories. The challenge is open to all who would like to participate and for more information, click here. To read all the fabulous stories submitted for this challenge, click here. You have beautifully described the human feelings. Married life is beautiful. It is full of love and care and at the same time it requires patience to respect the feelings of others. Thank you so much Madeeha! You have described married life very well! I appreciate you reading and for your wonderful comment. Happy endings are nice! I like to make most of my stories to have happy endings. At least for now I’m in the happy ending kick. LOL! Aw lovely. Mind you, he could have given you a whole bunch of roses! That’s true! But they are young newly weds and don’t have the money to spend on flowers. Thank you for reading and commenting! I’ll add in my vote for happy endings! And what a great commentary on married life, that stepping away from a fight to think and calm down is good, if you come back ready to forgive and forget. Thank you Joy! I appreciate you reading and your comment. I think disagreements often just need some time apart to think and cool down. Great story. It is very realistic I think because I know couples who have had almost the exact thing happen. So cute he had the rise for his wife at the end. Thank you so much Mandi! I think you are right about other couples experiencing this. When couples fuss and fight, if they will give themselves time to cool down they will see how petty the fight was to begin with. Yes, he was in love with her as much as she was in love with him. I like reading stories that I can read a lot into especially if it is positive. Thank you so much for reading and for your wonderful comment. It’s such a lovely story. None of the harsh bitterness between them, just a period of time for both of them to reflect on the situation and come back feeling the deep love for each other that keeps them together. So sweet and thoughtful of him to give her a rose and is ready to have a reasonable conversation between them. Thank you so much Jessie! I think you are right! Thanks for the wonderful comment and for reading! Compromise is key, especially as they grow with each other. A lovely tale. Thank you JR! I think too many of us say things and make decisions based on negative emotions and that isn’t good for any relationship. Lovely photo, and story to go with it. Silly arguments are always best walked off, and making up is wonderful! Nice one Joy. If only all disagreements were so easy to resolve. Yes! If only they were. However, I have a feeling 80% of them are that easy if only they would walk away and cool off before saying anything more. That’s a great quote! Because it is absolutely true. Florist’s incomes are dependent on guys making apologies, at least between the Hallmark holidays. is there a secret society of florists that control relationships? 🙂 Enjoyed your story! Hope he doesn’t make that a habit! Maybe not a runner… a needer of space? and an admitter of wrongs? A great lesson that both partners should cool off–she went for a walk, changed her scene and he took time and brought a peace offering. It really can be that simple. I understand. Sometimes you gotta get up and leave to get space between you and the problem. I think my folks were kind of like that. Fights all the time, but they did make up – vowed not to go to bed angry at each other. Only problem with that is they kept me up half the night sometimes screaming until they solved their problems. Lucky for me though in 36 years with my guy I can count nasty arguments on on hand. We use humor as our glue! Thanks for stopping by Rumors #6 – Which is all fiction. Though I did read a book recently where the child was ignored by a house full of adults. Every thing we read or see sneaks in to what we write… somehow. That’s wonderful about your guy! And, yes, our lives do sneak into what we write.